NZPF President Whetu Cormick, right, presents CrestClean’s Managing Director Grant McLauchlan with a long service certificate in recognition of the partnership between the two organisations. CrestClean has been officially recognised for its ongoing support of the New Zealand Principals’ Association. 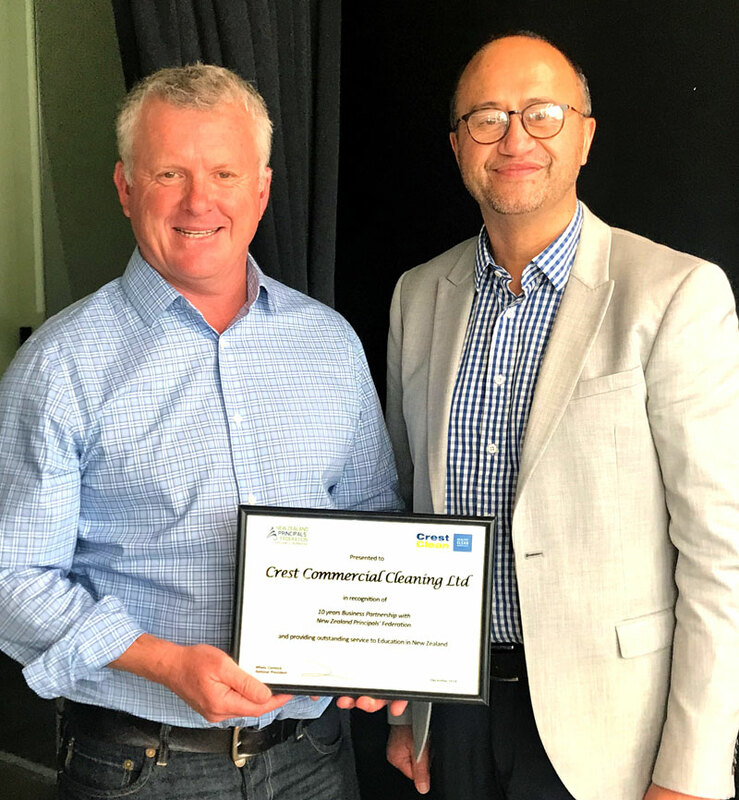 NZPF President Whetu Cormick presented CrestClean’s Managing Director Grant McLauchlan with a long service certificate in recognition of the decade long partnership between the two organisations. He chose the recent annual meeting of the NZPF business partners in Auckland to make the presentation. “We are proud to be celebrating 10 years of partnership with CrestClean,” said Whetu to the gathering. 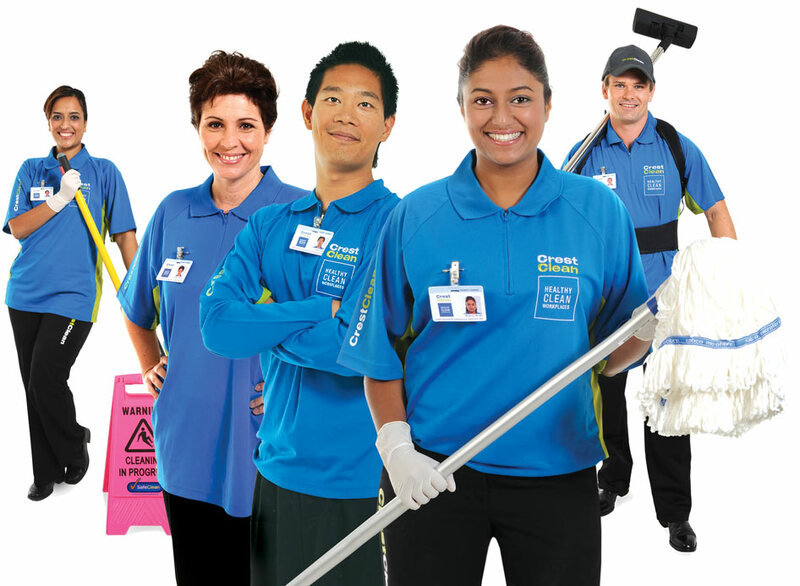 Whetu noted that at least half of all New Zealand schools now contracted CrestClean to work in their schools providing cleaning services, caretaking and grounds maintenance. “Ten years ago, CrestClean was largely a cleaning company. Now the company offers so many more services to our schools, making it easier to cover multiple functions through the one company,” said Whetu. At the heart of the partnership is the willingness of the company and NZPF to communicate. “Through building a strong relationship with CrestClean, we share ideas and learn from each other,” said Whetu. CrestClean has also forged connections with other businesses that partner with NZPF. “The great thing about our family of business partners,” said Whetu, “is that our partners find synergies with each other and combine strengths which have mutual benefits,” he said. He cited the case of CrestClean and Alsco partnering to provide schools with a more comprehensive cleaning and supply of consumable products, which is working well for both businesses. “CrestClean teaming up with Alsco is a good example of using our networks to benefit schools and business,’ said Whetu. “This is just one way that the relationships we have with and between our business partners works well,” he added. Whetu congratulated CrestClean on achieving its 10-year milestone and wished Grant a prosperous future and on-going relationship with the NZPF.